The dog food brand created a product that attaches the brand’s DentaStix dog chew products to any mobile phone to help capture their pet’s attention and focus for the perfect photo. An integrated campaign featured photogenic dogs, showcasing their best duckface and blue steel looks will run across digital, social, print and in-store media across Australia and New Zealand, ahead of a global rollout. The app converted peoples’ canine companions into a cast of characters, including police officers, aviators, university graduates, safari explorers and cowboys by using a unique combination of canine facial recognition technology and machine learning to track the dog’s face, which allows for accurate placing of the filters. It then lets people share their filtered selfie through social media and will release new filters around special occasions like Valentine’s Day and Easter. The campaign was created in partnership with Colenso BBDO. “We love our dogs, so why not give dogs access to all the fun things us humans have too?” said Cormac van den Hoofdakker, brand manager of Pedigree at Mars NZ. Often considered an incremental purchase and a ‘functional’ treating product, we needed to find a PR-friendly way to encourage customers to pick up the Pedigree’s DentaSTIX product over competitors, shifting perception of DentaSTIX to a ‘positive’ treating product. The brief was to create a value-add; to create meaningful moments between dogs and their owners; to drive repeat purchase of the DentaSTIX product. Pedigree trained a neural network to recognise dog faces by feeding it thousands of dog images. Over time, the trained algorithm learned to recognise similar patterns across all images and then, whenever the dog looks at the camera, the app places a fun filter on its face. The clip, app and campaign elements encouraged the sharing of images and videos across all social platforms - letting dog owners participate in a rich social community of like-minded pet owners. 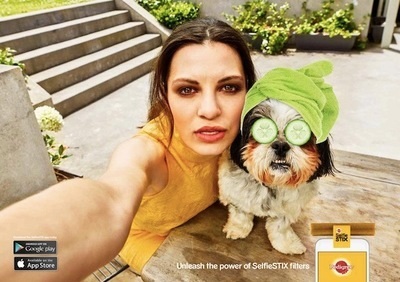 SelfieSTIX and the accompanying app not only encouraged people to share their perfect doggy pics, it also encouraged repeat purchase of Pedigree DentaSTIX.